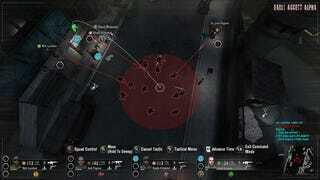 The Pitch: Squad-based turn-based and real-time military combat... with zombies. Turn-based strategy fans may already be aware of Breach and Clear from Mighty Rabbit Studios. I, myself, played it after picking up Humble Mobile Bundle 4. It's a solid tactical RPG, mixing some of the military-style planning elements of classic Rainbow Six with a more "top-down indirect control" feel of games like XCOM. Deadline is like that, but with zombies and... Wait, wait, I know, I know, "X with zombies" is a bit of an overused trope, but bear with me. Deadline really works well with zombies, as the combat is a mix of both turn-based and real-time elements. Your squad will generally fend for themselves - you can tell them to get behind some cover and which direction to face, and then they'll plink away at zombies on their own. You can also queue up some orders and have them throw grenades, lay down covering fire, or set traps. In addition to this, you can take direct control of one of your squad members and play the game somewhat like a dual-stick shooter. Dart out of cover, take a few shots, dart back in, reload. This requires a bit more twitch skill than relying on the AI, but it can be used to great effect in the right situations. Underpinning this is a more flexible turn concept, where the game is paused by default, and pressing a button unpauses it to allow your commands to be executed. At any point, you can stop time and reevaluate the situation, and give new orders on the fly. I've seen several games that kind of flirt with this particular combination of mechanics before, but nothing that takes it to the level that Deadline has. I found it very natural, giving me the right amount of control without being overwhelming or overly reliant on micromanagement. Well-executed strategic combat is one of my favorite elements of games like this, so I'm eager to see what the devs behind Deadline do with it. Bottom Line: Classic military squad-based tactical combat mixes with modern dual-stick shooter elements (with a dollop of shambling zombie love) to create Breach and Clear: Deadline. Breach and Clear fans and tactical combat lovers in general should give it a look. Indie HYPE is my series on interesting indie titles that might be flying under your radar. If you're an indie fan, browse the HYPEchives or check out our indie coverage on WOTS!